The message of Jesus as the Jewish Messiah has universal appeal. 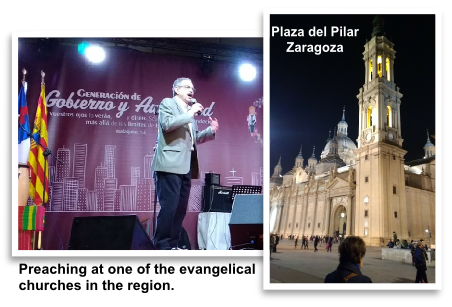 Even though our 27 years of ministry have been primarily based in this country, and we’ve been to forty states, we’ve had wonderfully successful trips to a few other nations, such as India, Fiji, Cuba and Canada and now Spain in the Fall of 2016. Our dear friends Marlan and Mercedes Olson invited us to come to their city in northeast Spain. Details about the city and mission there are in Marlan’s letter at left. The nearly three weeks we spent in Zaragoza, Spain, were amazingly productive. Karen and I had seventeen formal ministry opportunities at congregations, and many more in homes, and even on the streets. We were blessed to pray with several people to receive the Lord, including an atheist. 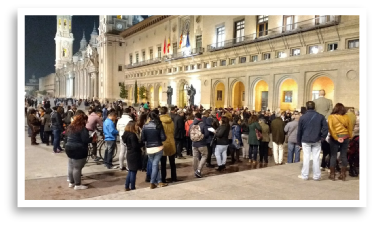 A significant number of Spanish people, at least in the large city we visited, are cold to the Gospel. We met several who were atheists, and others who proclaimed no interest in anything spiritual. The Bible believing evangelical churches, while very much alive and active, are modest in size; the largest number a few hundred attendees. So not surprisingly, the prevailing moral standards are fairly low. It is worse than what we’re fighting here in the U.S. Unmarried couples with children living together is commonplace, even within the church community. There’s a fairly strong “every man for himself” attitude in evidence, again seemingly more prevalent than in our country. Yet there’s a great hope among the believers for a breakthrough. 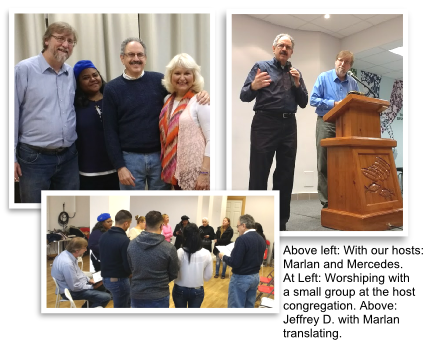 If nothing else, our visit there was an encouragement to the churches, and especially to our dear friends and wonderful hosts, Marlan and Mercedes Olson. They were constantly at our sides translating. 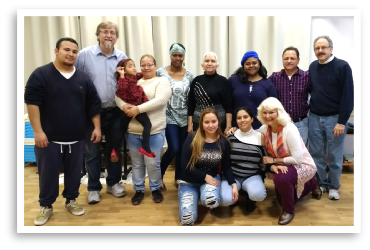 The seventh anniversary of their congregation, El Shaddai, was the impetus for this trip. One of the many highlights of our trip was the opportunity to bring a message to more than thirty pastors of the evangelical ministerium of the region. As was the case everywhere we went, we were very enthusiastically received. We also attended an event honoring the 499th anniversary of the Reformation. It was held on a large public square in between a massive shrine to Mary, and the spot where public executions of Jews took place during the Spanish Inquisition. But perhaps the most fulfilling aspect of our mission trip, of course next to praying for the salvation of several folks, was the time we spent ministering to members of our host congregation. Because we were invited to many of their homes, we got to have extended times of interaction and powerful times of prayer. There wasn’t a home we visited where something spiritually significant didn’t happen. In many cases, we were able to back up the solid biblical teachings which had been laid out by Marlan and Mercedes. However, because someone from another country was telling them the same things they had heard in their own church, it had great impact. On the very last day of our time in Zaragoza, my final ministry assignment was at a church where they received Communion before I spoke. Since they used leavened bread, I gave them an understanding of why they should use unleavened bread. At the end of the service, the head elder told me he had heard of this before, but since he was hearing it from a Jewish man, he now knew it was true. Also at that church, I was able to witness to another atheist who just happened to come to that service with his family. When I was finished, I led him in a simple prayer asking God if He is real, to reveal Himself. His sister told me she was astonished. She said he never listens to anyone about God because he is so sure there isn’t one. But he listened to me, all the way from Reading, PA, to Spain. I am sure that is one of the many reasons God sent us there.